A History of Strategy: From Sun Tzu to William S. Lind. Martin van Creveld. Helsinki, Finland: Castalia House, 2015. Strategists are a critical bunch. After all, critical analysis is an important skill for those involved in scrutinizing international relations, history, and policy to generate insights. It is therefore curious that Martin Van Creveld’s book A History of Strategy: From Sun Tzu to William S. Lind immediately opens itself to the nitpicking of strategists in two related regards. First, the treatment of such a vast topic is too brief, running just 124 pages. Second, as a natural extension of its brevity, the details about the strategists it addresses are rather sparse. 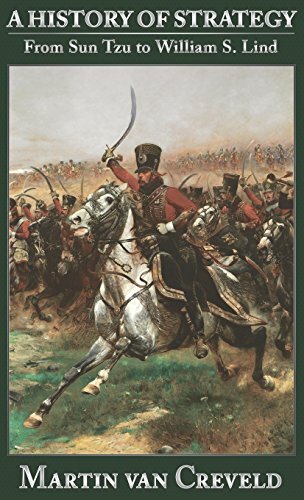 If the reader is able to overlook these limitations, however, A History of Strategy is a useful overview of the figures and ideas that form the canon of strategic thought. The text acknowledges these critiques by opening with an explanation for Van Creveld’s self-imposed limitations, namely his desire for “width over depth” and “comprehensiveness” over a more detailed treatment of the usual suspects such as Clausewitz, Machiavelli, Sun Tzu, and Thucydides. Van Creveld’s choices are ultimately wise ones, and he benefits by widening the circle of “important” strategic minds. At every juncture, A History of Strategy deftly balances the greats with more obscure names, such as Greek philosopher Onasander or WWI’s Erich Ludendorff, and each time justifying the compelling reasons for their inclusion. For Onasander, we get a healthy dose of the logical and ethical underpinnings of strategy, and with Ludendorff, the necessity of mustering the total means available to a country in wartime over military strength alone. These inclusions add richness to the journey, and help the reader appreciate strategy as a far more vast and interconnected field than the traditional staples covered in many military courses. In this spirit, Van Creveld chooses a chronological means of charting the history of strategy, breaking down its epochs into the subsections, “Chinese Military Thought,” “From Antiquity to the Middle Ages,” “1500-1763,” “From Guibert to Clausewitz,” “The Nineteenth Century,” “War at Sea,” “The Interwar Period,” and “1945 to Present.” This is as good a framing device as any, allowing the reader to consider the figures of each period as a sort of class among themselves, all grappling with a similar context. Despite the generally chronological approach, one effective technique he employs is doubling back when appropriate to highlight the influence of a previous strategic thinker on the one under consideration. A particularly gratifying example is the influence (or lack thereof) of Clausewitz on naval strategists Alfred Thayer Mahan and Julian Corbett. Van Creveld asserts that while Mahan unwisely ignored Clausewitz’s writings about the periodic necessity of dispersing one’s forces, Corbett heeded this advice and produced a more utilitarian vision of naval strategy as a result. Later on, the chapters covering the interwar and postwar periods contain a number of valuable insights for the modern strategist. Van Creveld begins his history of the interwar period with an examination of the air strategist Giulio Douhet, concisely outlining the lessons Douhet gleaned from WWI and the current state of technology, and then examining why Douhet was so enamored with the tool of aerial bombardment as a means of inflicting one’s will on the enemy. Van Creveld’s critique of Douhet is one of the more effective in A History of Strategy, as it forces the reader into Douhet’s head as he grapples with the new aerial tools in play, the lessons of WWI, and classic strategic thought, in order to lay out how and why Douhet ultimately conflated war and warfare to an unfortunate degree. This lesson seems quite pertinent in modern context, lest today’s strategists become infatuated with rapidly developing tools of warfare over classic principles of war and strategy. The final chapter poses some larger challenges for the author, as Van Creveld is essentially forced to choose from among his contemporaries as to whom to include in the pantheon. Fourth Generation Warfare theorist William S. Lind is one name to emerge as a contender, while Thomas Schelling is praised as a particularly influential figure amid the Cold War’s mix of economics and the fearful tools of the atomic age. Mao Tze Dong and his model of protracted war is highlighted as one of the book’s few strategist-practitioners, as is Lawrence of Arabia, a welcome if somewhat surprising inclusion. Predictably, Ludendorff’s name resurfaces in the Cold War discussion, as the Soviet Union and United States harnessed their respective portfolios of national power, allowing another useful reach backward to explore the ties between ages. Unfortunately, fighter pilot turned OODA Loop originator John Boyd is omitted from the mix, and while the cyber domain is briefly discussed it is absent an identifiable strategist figurehead. A History of Strategy is not intended to replace the tomes resident on the bookshelves of all students of the strategic arts such as On War, The History of the Peloponnesian War, The Art of War, or The Prince. Van Creveld’s ambition is much more modest, seeking instead to provide a compressed version of the connective tissue running from masterwork to masterwork and theorist to theorist. In this regard, the book is a useful supplement to the canon. It fills a modest but unmistakable niche, letting the reader survey the long view of strategy in a compressed amount of time. John McRae is an Army officer and founding member of the Military Writers Guild. His blog MILopoly covers the intersection of economics and defense. The views expressed in this article are those of the author and do not reflect the official policy or position of the Department of the Army, Department of Defense, or the U.S. Government. Header Image: "Scotland Forever," painted by Lady Butler (1846-1933).